Perhaps the most uneven, together with his first (Los motivos de Berta ), of José Luis Guerín’s features, Innisfree is also, probably, the most unexpected and unlikely film for a young Spaniard to make. The idea was to revisit the places – several villages including Cong in County Mayo – where, almost 40 years before, John Ford had shot The Quiet Man (1952), creating the mythical Innisfree from a composite of a number of locations in the area. Guerín’s aim was to look for the “tracks”, traces and memories that the filming had left behind – revisiting the sites used in the film remains a minor tourist attraction – as well as to search out the actual places that had materialised on screen. Ford’s vision, made up of his own recollections and fantasies of Erin, created an image that has seduced moviegoers around the world for decades and has spurred an otherwise unexplainable attachment to the green grass, ever-changing light and folksongs of Ireland for many long before they set foot in the country. It may now seem strange for a filmmaker to be compelled to research his chosen roots, but that is precisely one of the features that make Guerín stand apart from much of Spanish cinema. He’s the kind of director that the mainstream “industrial” or “commercial” cinema pushes to the side and keeps at a distance, because the “establishment” rejects automatically anyone who wants to make movies driven by desire and curiosity, that are created with patience, endurance, time and freedom rather than money, stars or any kind of luxury, and who wonders about what cinema is and should or could be today. Most of Guerín’s colleagues do not understand or even fathom the motives that drove him to make, despite many difficulties, such an un-Spanish film, defying a very Spanish distrust towards anyone interested in things foreign. The very idea of going with a small Spanish crew to Ireland to shoot for several months, exclusively in English (and even a bit of Gaelic! ), without actors or a plot, vaguely dealing with a very old American film based on an idea of Ireland passed onto its director by his homesick immigrant parents – and comparing it with the quite different present day reality of that same territory almost 40 years later – seemed utterly pointless and wholly unprofitable at a time when commercial success had already become, for many, the single criteria for judging films. Apart from his inner personal, affective motives, I can easily understand that Guerín, a filmmaker fully aware of the past and his place in the history of cinema, and who consequently feels grateful to the work of his forebears, must wonder why he has chosen such masters instead of others. He wants to acknowledge his debt even if those “masters” are dead and buried and there is no other way to do it than by taking a roundabout path. He achieves this not by emulating or aping them, much less aspiring to take their place, but by conversing with them through the “tombstone” (a medium through which so many Fordian characters have talked with to dead loved ones) of one of Ford’s most personal films. On the other hand, Innisfree marks the real starting-point of Guerín’s persistent, many-sided exploration of the unseen part of each shot, of the space off-camera, of what is deliberately or unconsciously left outside the frame – but which for him is, nevertheless, implicitly, also a part of each shot. This covers what is in front, above, below and to both sides of the camera and frame, as well as (particularly in Tren de sombras ) what lies not only behind the camera itself but also beyond the actors/characters being filmed. Unable to use excerpts from The Quiet Man (the then new owners of Republic Pictures did not understand the project at all and seemingly feared Innisfree might damage further exploitation of Ford’s movie in theatres and on video), Guerín had to evoke it through roughly reconstructing some of its more emblematic images, a few stills, and by filming the present-day reverse angles of the shots he could not visually quote. This all has the haunting effect of somehow summoning the spectre of Ford’s film, especially when accompanied by snatches of dialogue, noises, or the musical score from the its soundtrack. In this regard, Innisfree goes far beyond a mere but deeply felt tribute to The Quiet Man and Ford’s memory. It is a somewhat random exploration of the image-making and myth-making powers of Classical Hollywood cinema (particularly when one of its best and most personal filmmakers was at the helm), and of the lasting impact and memory that the filming of a Hollywood movie left all over the area in which it was made. It is also, and on the other hand, a documentary about County Mayo in and around the year 1990, and the effect of a screening of The Quiet Man on the young inhabitants who had heard about it but had never watched the film before. The result is a loosely-constructed film (not as tightly and carefully structured as Tren de sombras, for example), which does not require a prior knowledge of the film it evokes (although, certainly, it is much better to bear it in mind, and The Quiet Man and Innisfree would make a most appropriate double bill). 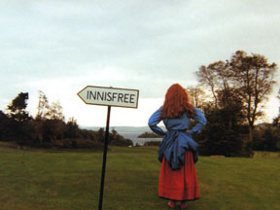 Innisfree can stand on its own as a rather peculiar documentary showing that, however oneiric and idealised the country depicted by Ford might have already been in 1951, the director succeeded in capturing something of its essence, a spirit that remained in its people, old or very young, for several decades afterwards.